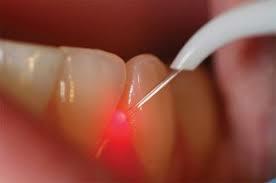 This is a noninvasive procedure called sulcular debridement, also referred to as laser bacterial reduction. It is used to treat inflammation of the gum by reducing the bacterial level below the gum line from millions to hundreds. The procedure is so simple that anesthesia is not always necessary! By killing all of those bacteria, the tissue responds by decreasing the inflammation, allowing patients to maintain healthy gum at home. In more severe cases of periodontal disease where bone loss is present, the laser can be activated to stimulate bone growth and remove diseased tissues. 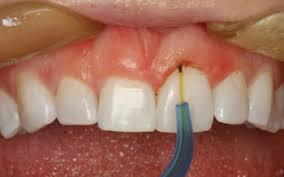 This procedure is very effective when done in conjunction with scaling and root planning.